Equipped with a hydroelectric turbine system and solar panels, with a little bit of help from the sea and sun the Tesla Model Y yacht has a self-sustaining design, unlike Tesla cars. 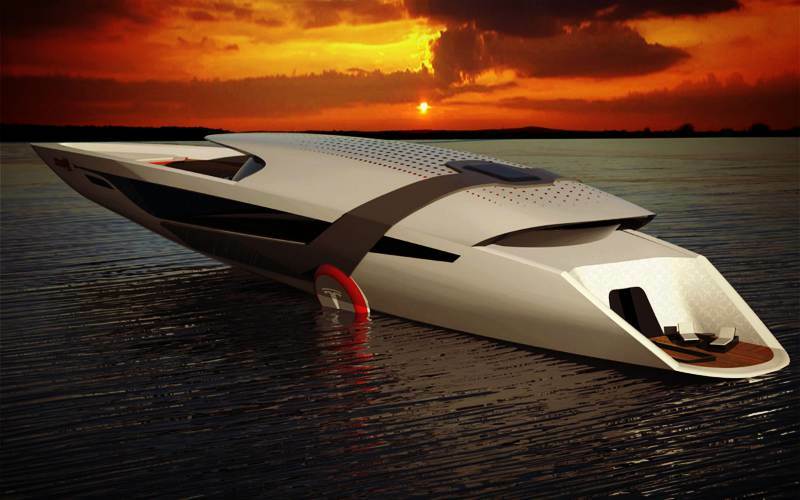 The yacht utilises an under the hull process in order to recover energy, which is a system rather similar to regenerative braking. Its hydroelectricity turbine system works under the hull, collecting energy while the yacht flows through the water. The solar panels on the upper deck harness energy when the yacht is idle. The energy which is obtained from the turbine structure, located around the middle of the throttle, is stored in the batteries and some of the energy which is used during the cruise is recovered. All of these elements mean that the yacht could cruise for long days without requiring fossil energy. The Tesla Model Y yacht is a generous 40 metres in length. Features include a low lying area for sunbathing and a jacuzzi where you can relax. Currently the yacht is in the prototype phase. However when it goes into production, there’s no doubt that the Tesla Model Y yacht could rock the foundations of the nautical industry. And perhaps in the future…. Tesla CEO, Elon Musk, recently recruited Andrej Karpathy, to further his autopilot vision. Karpathy is regarded to be one of the world’s top authorites on deep learning and computer vision. Perhaps in the future we can look forward to an autopilot version of the Tesla Model Y yacht.